Cornerstone content is quite possibly one of the most effective ways to boost organic search traffic, however, many bloggers and online business owners neglect to create this type of content, simply focusing on individual blog posts and SEO tactics. To set your website up as a valuable resource for your target audience, it's important to understand how to create cornerstone content and use it effectively. Cornerstone content pieces should be created for each of your main categories, and be a resource page of sorts, linking to other related content and essentially defining each category. Learn how to create cornerstone content and how to use it effectively. Cornerstone content is, in essence, a resource page created for each of your website's main categories. This piece of content should give your readers a broad spectrum view of everything you know about that category, and links to relevant content to continue learning more. If you have years of content on your website already, you may already have a piece of content that can be repurposed as cornerstone content and optimized as such. However, if you are fairly new to blogging, you might need to create a piece of cornerstone content for each category from scratch. For solid site organization, you should limit your content to 3-5 main categories. (Use subcategories when necessary.) Defining your main categories helps your readers understand, at a glance, what you write about on your blog, and it helps search bots understand what your content is about as well. Learn more about site structure and it's importance on SEO in THIS POST. At this point you should understand how important keywords are for blog posts and pages. The keywords you use for your cornerstone content pieces will most likely be a bit more broad than the long-tail keywords used in individual blog posts. Remember, these are meant to be overall resource pages. Take time to use tools like Google's Keyword Planner to hammer down solid keyword phrases for each of your cornerstone content pieces. Your cornerstone content is a resource for each of your blog categories, which means you should already have a library of related content. (If you're a new blogger, you'll be building this library of related content.) Within the body of your cornerstone content piece, you should link to several high-quality posts in that category. Now that you have these epic pieces of content, what do you do with them? Having these pieces of content on your site just sitting there won't necessarily help you with your organic search all by themselves. Ideally, every blog post in each category should link back to the cornerstone content within each category. Make sense? So each post in your "Desserts" category should link back to your cornerstone content for "Desserts". Why? >>> Link Authority. When you have a lot of relevant links going into one piece of content, search bots take notice, and guess what? They follow those inbound links, and they rank that piece of content higher in search. To continue building that link authority, make sure you're linking to those pieces of cornerstone content any time you write a guest post on someone else's website. And here's the important part: make sure it's a FOLLOW link. It only counts for link authority if it's a follow link. Search bots can't follow no-follow links. Want an easy way to create your cornerstone content, and share relevant links? Add your cornerstone content piece to the top of your category page. 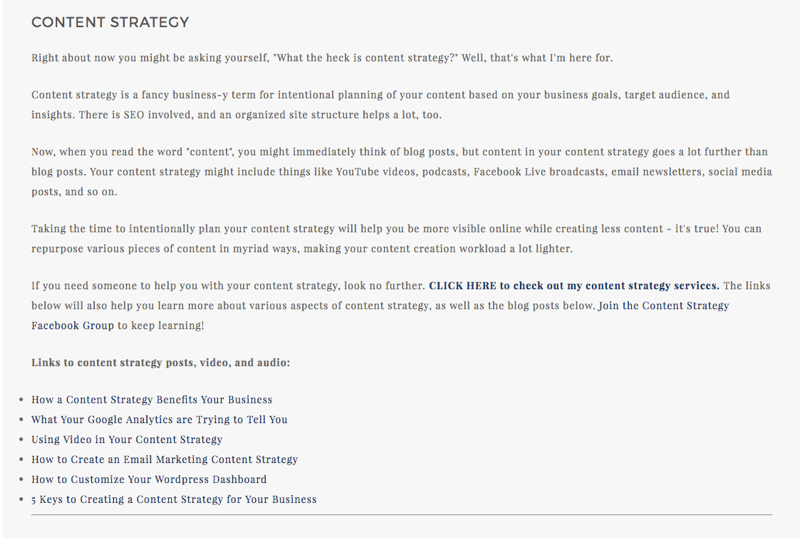 My own piece of cornerstone content for my "Content Strategy" category is set up this way. We often forget we have the ability to add typed words and links to our category pages, but it's usable space, and it boosts SEO to those pages. Finally, don't write your cornerstone content as a one-and-done type thing. As you learn new information, or create other high-quality related posts, add them to your cornerstone content, keeping it current and fresh.